We kicked off this summer with a bang! 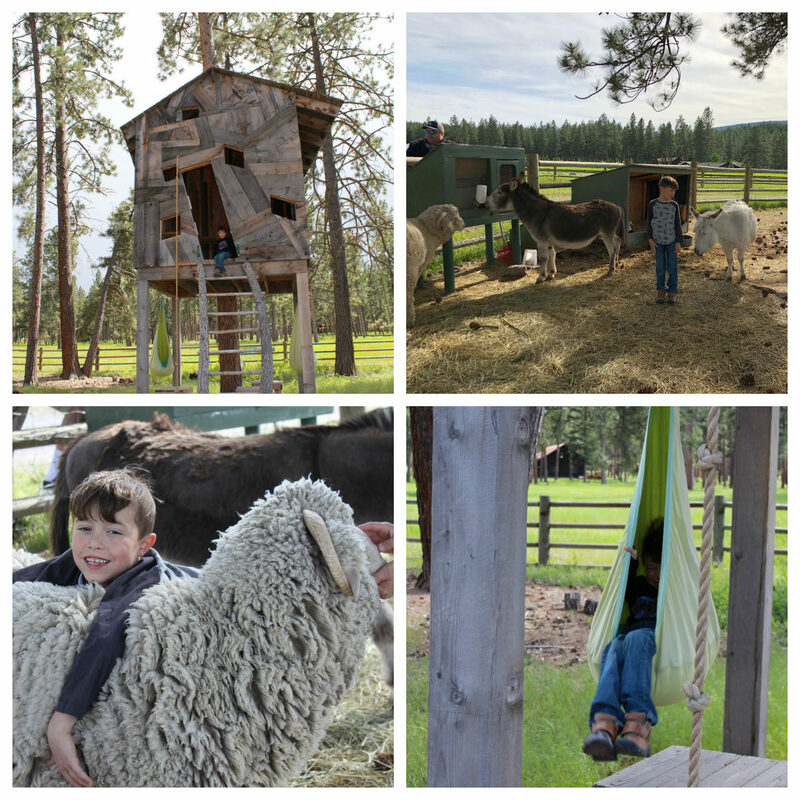 We headed off to an incredible luxury family vacation at The Resort at Paws Up in Montana. It was our first time visiting the great state of Montana and we couldn’t wait to take in the breathtaking landscapes. We knew from the photos we’d seen when we planned our trip that it was going to be great, but we never guessed just how truly special Paws Up would be! My whole family loved every minute on the Montana ranch. And, it was truly love at first sight for my 7 year old son Harry. There’s a reason so many celebrities flock to this place to get away from it all. With 37,000 acres of Montana magic, it’s amazing to escape to big skies, fresh air and old-fashioned fun. 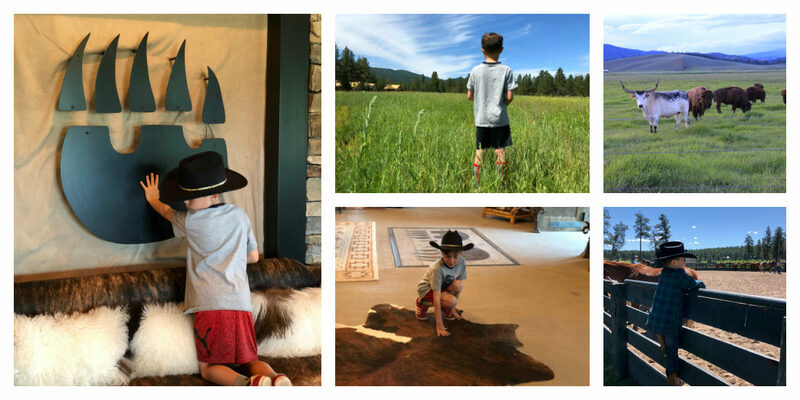 Now summer is almost over, and we still reminisce about our extraordinary stay at Paws Up almost every night when we are putting Harry to bed. He talks mostly about missing his favorite camping butlers, riding his horse, axe throwing and remembering the beautiful rainbow he saw in the fields after dinner at Pomp one night. Because our Paws Up family vacation experience was so exceptional, I’m overcome with a desire to share every detail of this magical place with friends and readers. All of the specifics of our trip came together so perfectly and pretty quickly. It was a team effort- I did my homework and the team at Paws Up really worked with me ahead of our stay to plan an amazing family adventure. 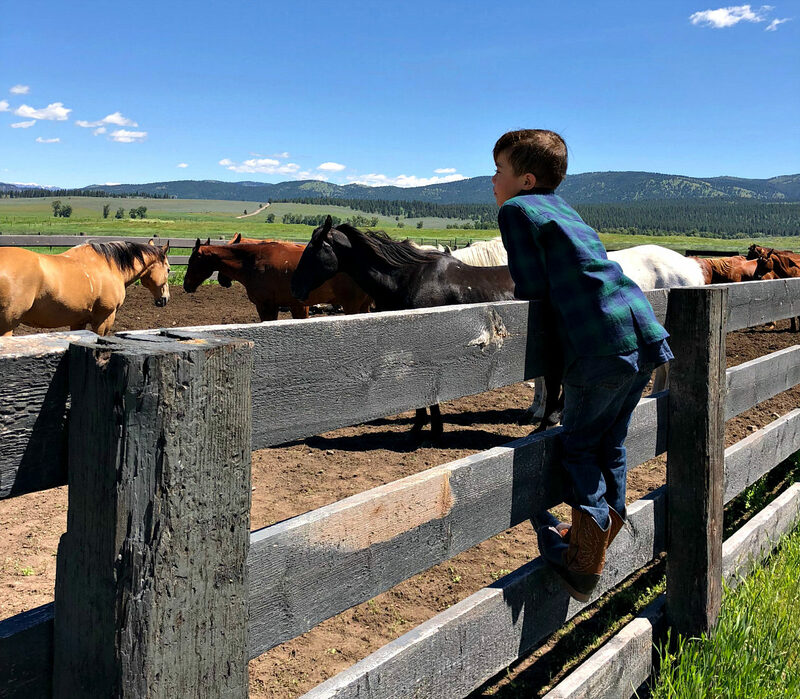 I’m sharing with you in the sections below every nugget of how to plan your ultimate Montana ranch vacation at The Resort at Paws Up. I promise you will thank me later! 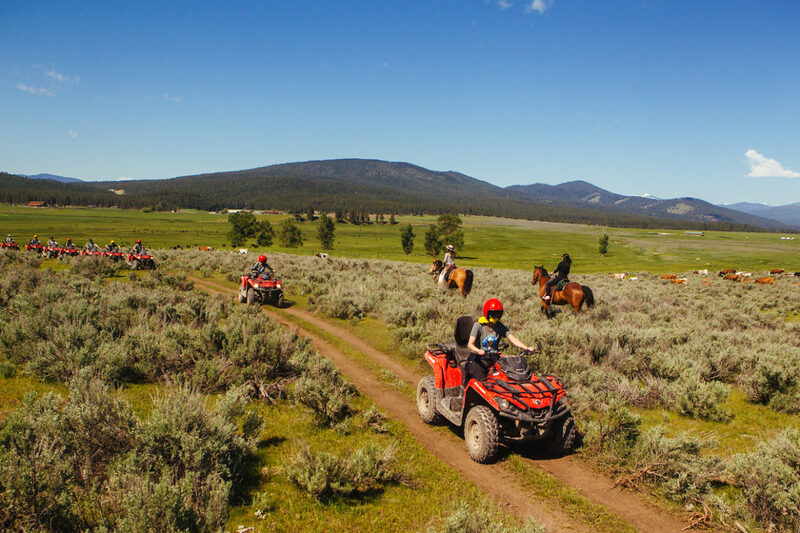 Read on to start planning your own unforgettable Montana Ranch vacation at Paws Up. Best of all Montana Resorts for Amazing Montana Adventures! 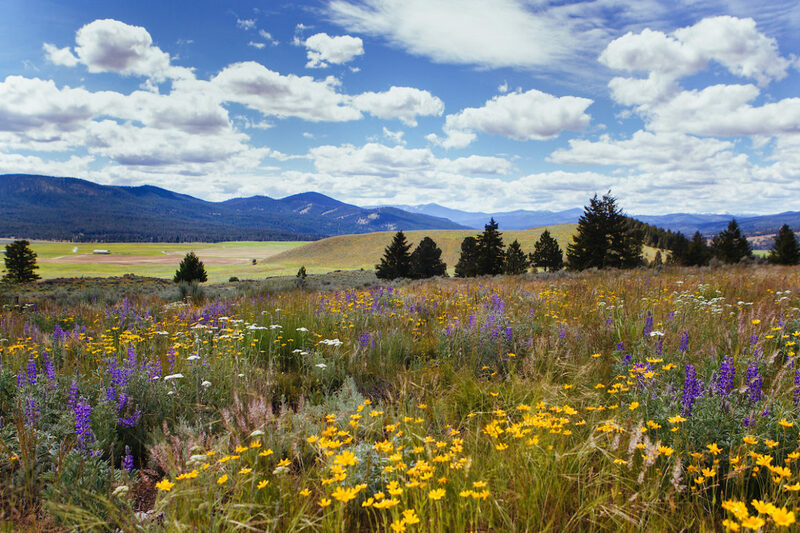 There’s a reason the Resort at Paws Up is known as The Last Great Place. It offers an unforgettable luxury Montana ranch experience that everyone will love. 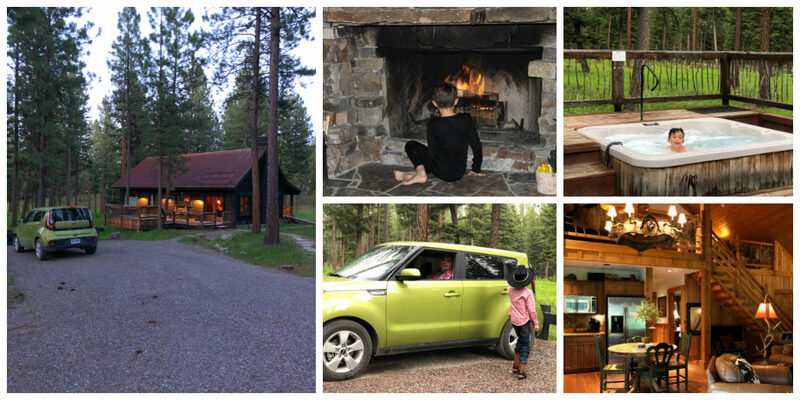 A stay at The Resort at Paws Up is perfect for families, couples, girls weekends, guys weekends, and relaxing solo getaways. 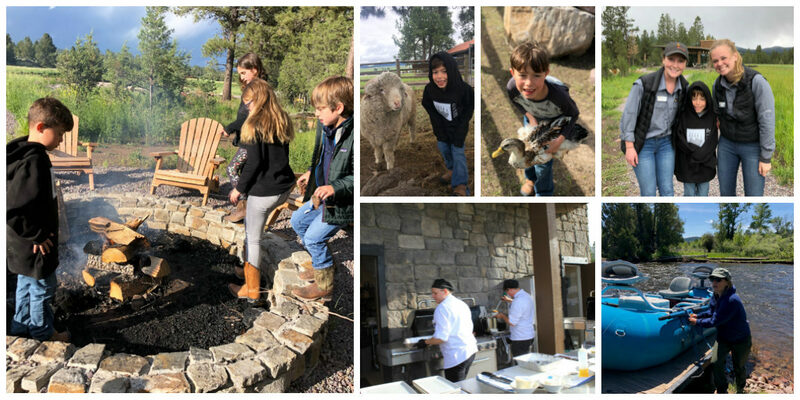 The Resort at Paws Up is a great destination for a multigenerational family vacation.The entire resort is super kid-friendly for children of all ages. I saw happy families enjoying their vacation with infants in strollers, toddlers and teenagers. During our stay we saw lots of grandparents joining in all of the fun. At camp one night, we even had one grandma boasting about doing the ropes course with her grandkids! I was pleasantly surprised by the display of girl power at The Resort at Paws Up. We had women as our camping butlers, our chef at camp was a woman, our fly fishing instructor was a woman and we met so many cool, rugged women during our stay. 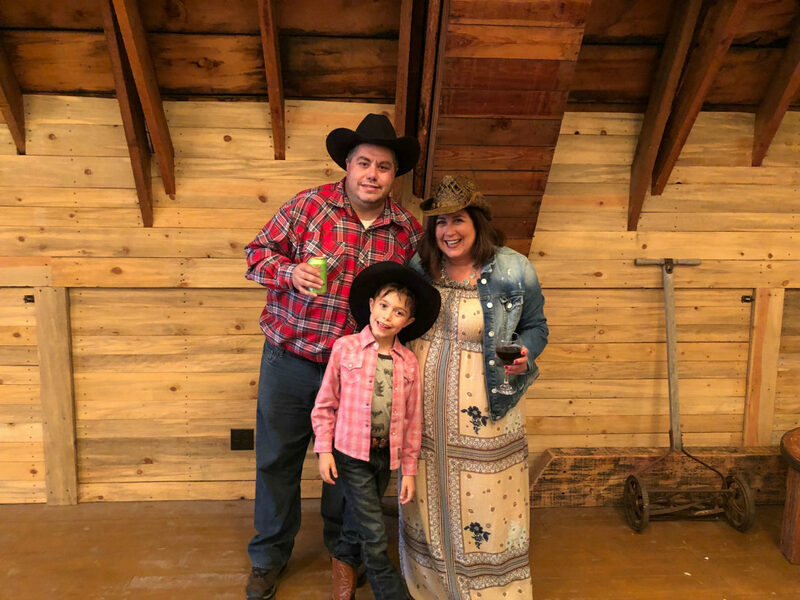 As a mom, it was really empowering for me to show my son that both men and women can be outdoorsy and are able to have a great ranch vacation experience. I’d love to return sometime with a few girlfriends for a fun outdoor Montana adventure girls trip. Begin by following The Resort at Paws Up on social media. Their Instagram feed will give you a taste of the best of Paws Up to help you prioritize how you want to plan your Montana adventures. Next, head to the Paws Up website and start planning your visit in detail. When deciding on dates to visit, be sure to check for special event weekends. These weekends are very popular because The Resort at Paws Up goes above and beyond their already spectacular offerings. Examples of guest favorite times to visit include: celebrity chef series weekends, wine weekends, photography workshops, Thanksgiving time, Christmas time, Spring break, Memorial Day, and a 4th of July week. When you are ready to book I recommend calling the reservations team on the phone. I worked with Heather when booking our stay and she was terrific. Not only did she help plan the specifics of our stay, but she also gave me suggestions on where to stay for our Montana side trips afterwards to Glacier National Park and Yellowstone National Park. Your first decision is whether you want to stay in a luxury glamping tent, a luxury home, or both! We decided to split our stay between the two, so we could experience the best of both worlds, and we’re so glad we did. If you’re staying more than four days, I definitely recommend sampling both accommodation options. We stayed in the home first, then the cabin, while others liked it the other way around. Both options are so amazing, I don’t think the order really matters. There are 28 luxury homes on property, with up to four bedrooms for your family. It’s not unusual for multigenerational families vacationing together to occupy a few homes next to each other to accommodate their group. I recommend viewing the floor plan online to choose the option that works best for your family. Our two bedroom home was perfect for us. The second bedroom was up on a loft above the living room, my son Harry loved being perched in the room above us. However, if you are staying with very young children, they may not be comfortable being upstairs by themselves. The reservations team at Paws Up will help you select the right home for your needs when you call to book. The luxury homes are expertly decorated, big, cozy, and awesome to hang out in. Our home included a full kitchen, a big front porch, giant fireplace, our own personal hot tub, 2 bathrooms, 2 bedrooms, and a laundry room. The marble bathrooms have big etched glass windows, plus heated floors and towels. Each home also comes with a Kia that seats five, which you can use to get around the entire ranch. It’s like having your own private home, but with full five-star hotel service.The staff at Paws Up goes out of their way to make your stay as comfortable and luxurious as possible. This includes twice daily maid service and they pre-build a fire in your fireplace so you only have to light it. There’s extra firewood on your porch and they are always happy to deliver your meals to your home if you’d like to dine in. 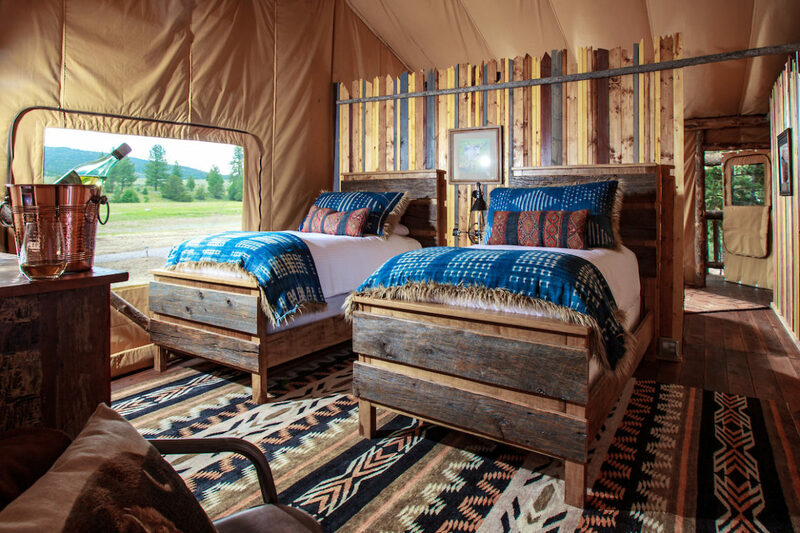 The Resort at Paws Up coined the phrase “glamping” (meaning glamorous camping) and they have been known as the premier luxury Montana glamping destination ever since. 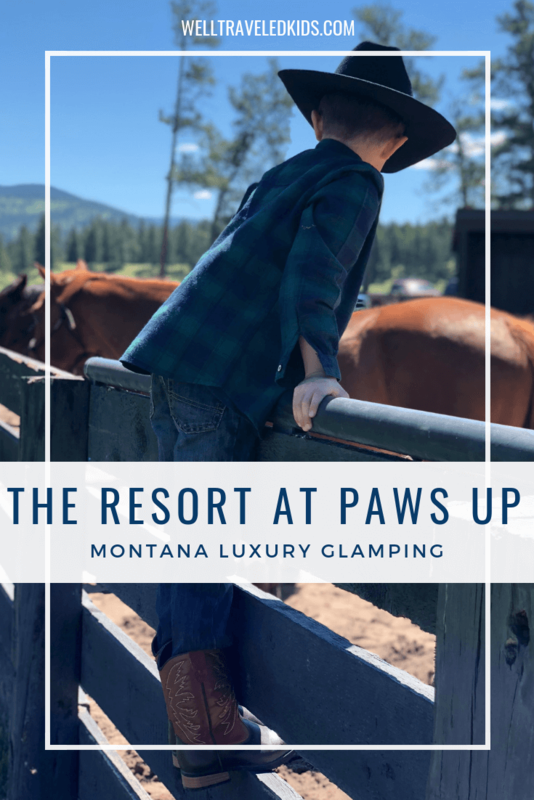 At Paws up there are six individual camps, each with six luxury camping tents located in different prime locations around the ranch. Each camp has a unique style and it’s own dining pavilion and fireplace for guests to gather at mealtime. We stayed at North Bank camp, the newest of the glamping camps. 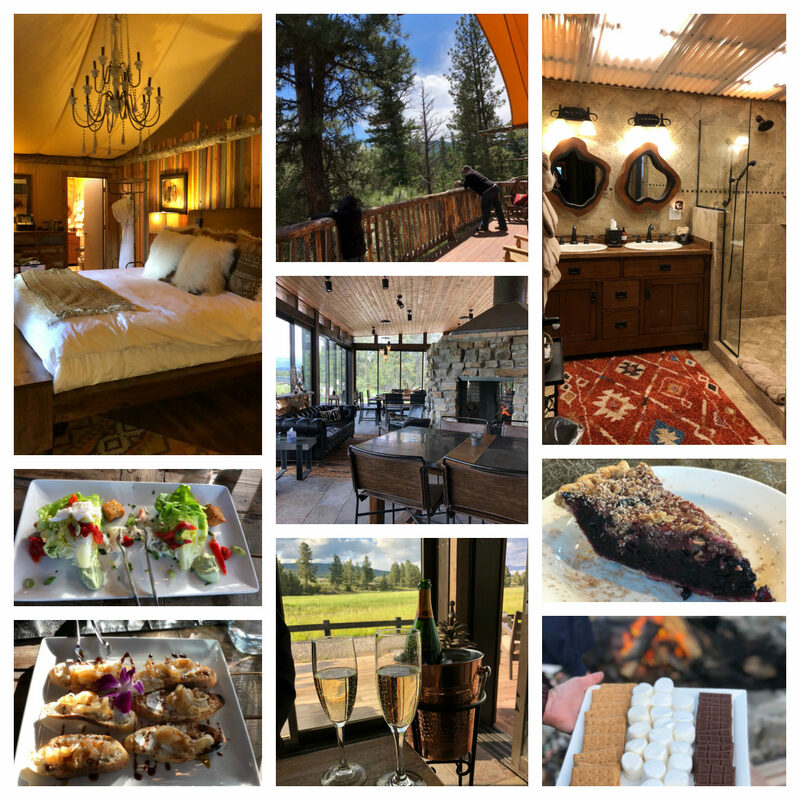 We fell in love with our luxury glamping tent that included heating and air conditioning, chandeliers, huge marble bathrooms with heated floors and headed towel racks. We had one of the largest tents available, with 3 bedrooms, 4 beds and 2 fabulous bathrooms. Smaller, 1 and 2 bedroom tents are also available. We loved relaxing on our big wrap around porch overlooking the Blackfoot River. The first people you meet at camp are your Camping Butlers. They greet you when you arrive and attend to all of your needs for the duration of your stay. The Camping Butlers wear a lot of hats at camp to make sure that everyone enjoys their stay. Our Camping Butlers were the perfect mix of amazing hosts, fun camp counselors, expert s’mores makers, craft cocktail bartenders, and the best vacation friends you’ll ever meet! One of the most fun things about camp is that when you’re staying at camp, you have your breakfast and dinner with other campers sharing your camp. It’s a much more intimate feel at camp, because you’re only sharing it with four to five other tents. Everyone gathers in the morning and at night in the dining lodge. The North Bank Camp dining lodge is stunning and modern. The floor to ceiling sliding doors at the lodge allowed us to enjoy the beautiful big sky views even when the glass was closed to keep us warm on a cool summer night. We became friends with a few of the families sharing our camp over dinner. Words can’t do justice to describing the fun we had partying around the campfire after dinner at night under the stars. Montana summers at camp are just amazing. How busy do you want to be on your Montana ranch vacation? Do you want to spend most of your time relaxing and enjoying your surroundings? 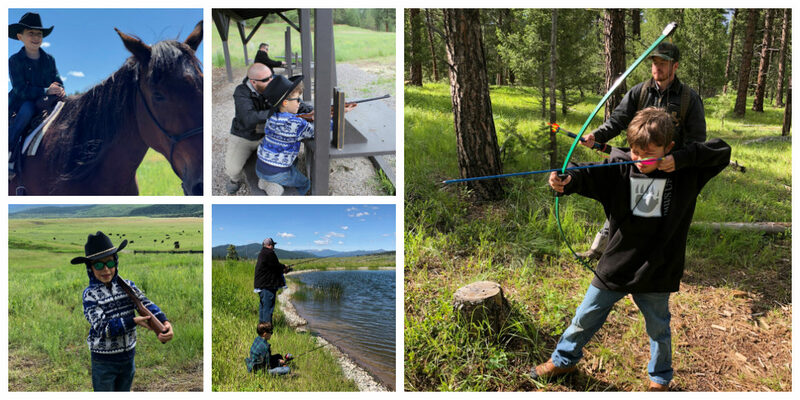 Or do you want to have action-packed days exploring the best of the Resort at Paws Up? The Resort at Paws Up will typically recommend anywhere from one to three activities per day, depending on your selection. Check out the options online, where you can also see the age ranges for kids and per person prices for individual activities. Have an idea of how you want your week to flow, and what you’d like to do each day, before having the call with your concierge. Have a list of questions ready so they can be answered as you make your plans. With all that said, you can easily change details if needed upon arrival. Having created a plan up front will make for a more relaxing arrival to Paws Up. My suggestion is to try booking quintessential Montana adventures like shooting, archery, river activities, and horseback activities. For us, this was a great opportunity to try new activities that we can’t easily do at home. For most activities no experience is necessary! We were impressed that the staff is very skilled at teaching first-timers. My son Harry learned archery, to safely shoot a rifle, ride a horse, and go fishing. Be careful not to over schedule. You’re surrounded by so much beauty everywhere at Paws Up. So, be sure to leave time in your days to roam and enjoy leisurely hikes, fishing on your own, or to visit the cows and buffalo that live at the Ranch. Paws Up is so picturesque it’s a photographers dream. Ask about booking a photo session for your family when making your vacation itinerary. 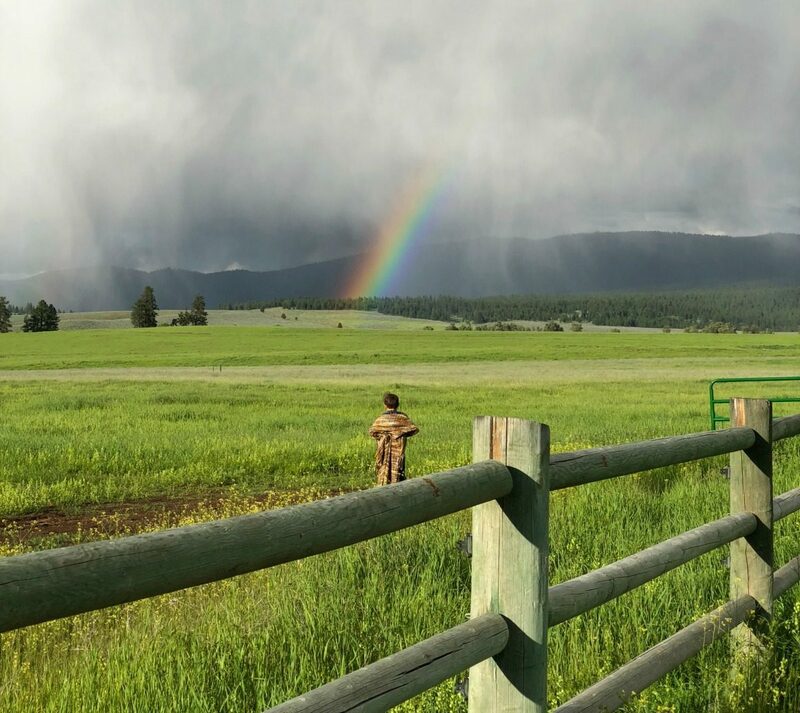 The Resort at Paws up has a partnership with award-winning photographer and filmmaker, Stuart Thurlkill, who regularly visits the ranch. We really wanted to book a family photo session, but hadn’t planned in advance and he was completely booked during our visit. Don’t make my mistake! Don’t miss booking fabulous body treatments at Spa Town. This unique Montana spa experience features a colony of luxury tents set in a meadow next to a babbling brook. The welcome tents have full baths and showers, while the treatment tents have heated massage tables and private views of the horses in pasture. I highly recommend a massage with Eric. The owners of the Resort at Paws Up brought him out from Las Vegas 12 years ago because they loved his massages so much. He and his wife started Spa Town and still run it. His massage technique was exceptional. Best massage I can remember! If you are traveling with kids, make time to Play at Kids Corps of Discovery. You can book kids camp ahead of time with the concierge. You can coordinate drop-off times for your kids to spend a full day or half-day while you enjoy adult activities. If you prefer, you or your nanny can attend the camp with your kids. Kids activities are broken up by age group. 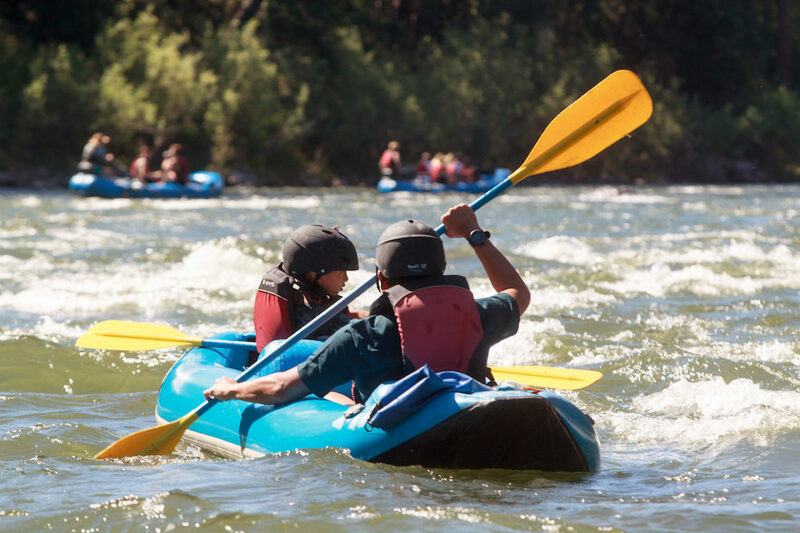 There’s Little Discoverers for children ages 3-5 and the Adventure Club for kids ages 6-12. There’s also a sports camp for kids ages 3-8, which is supervised by former pro-circuit tennis player Melissa Detwiler. Right outside the kid’s camp is a play ground, a giant tree house and a little petting zoo with baby animals. This was the highlight for my son Harry. He loved petting Lewis, Sugar, Cinnamon, Flopsie, S’Mores and Marshmallow. Our son Harry spend two half-days at the camp, and he loved it both times! One day they did arts and crafts and played with the animals. The other afternoon they went fishing and played in the water. Harry made friends with lots of kids at camp and loved the instructors too. There are water activities galore at the Resort at Paws Up, just no swimming pool. It’s all about enjoying the water Montana style. 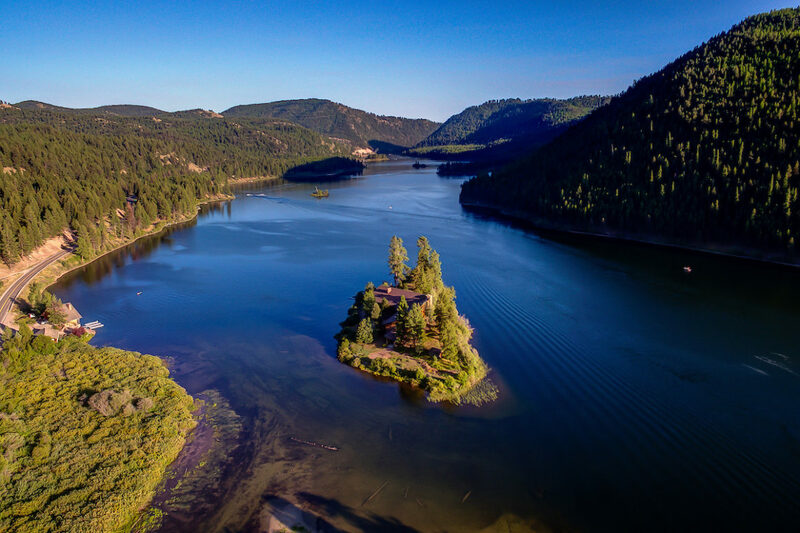 The Island Lodge at Salmon Lake, or the Seeley Lake House both offer access to fun water play. These homes provide access to jet skis, boats and other fun water activities, and can be reserved for a half day or a full day. In addition to planning your Montana adventures ahead of time with the concierge, you’ll also want to plan your dining and make reservations ahead of time. Be sure to try all of the amazing dining options, even if you are glamping for your whole stay. Don’t miss scheduling the Chuck Wagon dinner, which is not offered every night. Pomp is the resort’s fine dining restaurant. If you prefer to stay in and enjoy your luxury home or tent, the Resort can deliver meals to you. As with the ranch activities, you can always make changes if needed, but it’s best to reserve ahead of time, especially if you’re traveling with a large group. You can also reserve outdoor dining for your group with amazing views if you request it when you book. After planning out your itinerary, be sure to have them record any special preferences ahead of time. Let them know about any food allergies, special diets, bedding requests, etc. We found the staff to be very guest focused, they were excellent with all of our special requests. I recommend confirming your requests again shortly before your arrival to make sure your stay is exceptional. Your stay at the Resort at Paws Up includes a round-trip shuttle from Missoula Airport. You can schedule your shuttle with the concierge as soon as you book your flights. If you choose to stay in a luxury home at the ranch, you’ll also have a 5 passenger Kia to drive around the property. The resort also has a complimentary shuttle service, summoned through their app, for your use at any time. We decided to rent a car for a little more independence, which gave us the ability to explore some of the surrounding areas of Montana during our stay. Some of the fun side trips we took included Garnet Ghost Town, just 20 minutes away. We also decided to extend our Montana Vacation and road trip to the local national parks. Glacier National Park is a two hour drive from the resort, while Yellowstone is about 4-5 hours away. Be prepared to pack a lot for this vacation! Summer temperatures during our stay ranged from 35 degrees to 90 degrees, so we needed a lot of layers to stay comfortable. Depending on the time of year when you visit the concierge will send you a seasonal packing list. My friend Kim-Marie Evans also put together a great packing list that I found especially helpful. Here are just a few of my suggestions of what to really must pack for your Montana Ranch vacation. Camera: the whole resort is a photographer’s dream. The scenery is stunning, no matter the weather, with big skies and beautiful surroundings you will be taking lots of photos. Give your kids a camera too, Harry loved snapping his own nature pics! Cash for tips: Your resort fee includes some gratuity, but the staff is so amazing trust me you’ll want to tip them more. We spent around $1000 in cash in tips for our 4-night stay. This included tipping the bell-men, activities coordinators, meals, housekeeping, transportation and camping butlers daily. Western Wear: You can dress the part or don’t, it’s totally up to you. I had fun picking out western wear and jewelry. You can check out the Paws Up social media pages to get a feel for how to dress. Some families get very dressed up for dinner, especially at Pomp, but feel free to wear whatever you are comfortable in. I have a friend who goes glamping here every year and loves to eat breakfast and dinner in her bathrobe! Really, anything goes. Makeup: For the ladies, you can do your hair and makeup every day, or just throw on a hat and skip the makeup, like Tyra Banks did when she visited Paws Up a few days before us! Clothes than can get wet: Bring water clothes and bathing suits for playing in the water or rain. Clothes that can get dirty: This is a luxury ranch, but it’s still a ranch. Plan on getting dirty while you play! Polarized sunglasses: These are a must for seeing on the river! Boots and lots of shoe options: You’ll want boots, water shoes, gym shoes, hiking shoes and nicer boots/shoes if you decide to dress for dinner. I went a little wild and had a whole suitcase of boots and shoes. I loved having options and happily wore them all! Bug Spray: Yep, bug bites are not the Montana souvenirs you want to bring home. Hats: It’s fun to wear cowboy hats, but be sure to bring a baseball hat and a fishing hat too. The resort sells amazing hats, so no pressure to pack it if you don’t have a good one! Booze: You can BYOB to the Resort at Paws Up. Montana beer and wine is included in your stay, and you can purchase specialty cocktails like the Huckleberry Mule or a Huckleberry martini. We brought our own fancy bottles of champagne and wine, which was nice to have in our luxury home and at camp in addition to the house drinks and craft cocktails we purchased. The Resort is very allergy-friendly, but it can’t hurt to double check that they’ve recorded your preferences. Give them a call to confirm they have all of your special preferences listed. Want to hang out and snack during your stay? Ask to have your kitchen stocked before you arrive in your luxury home. It comes with a huge fridge so have them fill it with any special foods you need! Apply for your fishing license – every adult will need one if they want to fish. You can provide all of the info ahead of time, so they are ready for when you arrive. Re-read everything the resort has emailed to you since your booking. Click through the links, and start getting excited! Download the Paws Up Mobile App to your smartphone so you are ready to go upon arrival. Unplug or don’t, the choice is yours. The WiFi at Resort at Paws Up is excellent. We intentionally left our laptops at home, but we saw people working online at breakfast. Use the Paws Up Mobile App! Use it to update your schedule, cancel activities, and request transportation. The team supporting it is prompt and exceptional. Don’t be afraid to change your itinerary if the weather isn’t ideal. They are very accommodating to guests wishes. I did this at least 3 times on the app and it was so easy. Ask about conditions before fishing or water activities. We tried fly fishing on a day when conditions were bad. We went out with our guide and the river water was really high and fast, which was not ideal and actually a little scary. We hadn’t thought to ask about conditions ahead of time. Please be sure and learn from my mistake! Don’t be afraid to request what you want. For example, we knew we wanted to do hatchet throwing in Montana, and thought it would offered be at the Chuck Wagon. It wasn’t, so we asked Shaun the food & beverage manager about it. He arranged for us to have hatchet throwing at camp one night and it turned out to be one of our best memories. We’re so glad we asked or we would have missed out! It seems to me the staff at Paws Up must be trained to say YES! Everyone is extraordinarily helpful. Follow up on your special requests to make the magic happen. I get the feeling that they want you to have a wonderful vacation and that they’ll go the extra mile to fulfill your Montana vacation dreams. Expect amazing meals, no matter what your preference. They really cater to picky eaters, so if you don’t like what’s on the menu, they will make you pretty much anything. Just ask ahead so that they are ready for you come meal time. Shop ‘til you drop! 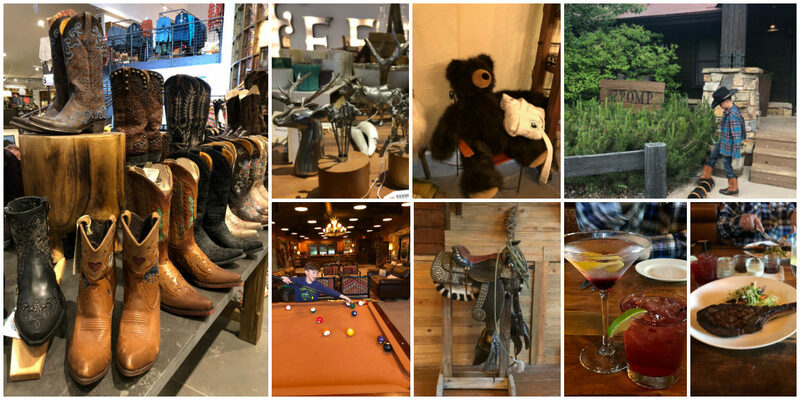 The outpost has the best shopping for everything including clothing for men, women and children, souvenirs, home decorations, toys, and artwork and jewelry from local Montana artists. Not to mention, amazing boots and cowboy hats! Make friends! Camp is all about who you share it with. Plan to socialize, make friends with your camping butlers and others you meet along the way. Roast s’mores every night and have a blast! Expect to possibly see celebrities, but please remember they are on vacation too, and leave them alone to enjoy it. Make time to appreciate the big skies, breathe fresh air, and roam the enormous property and explore. Go on a relaxing or challenging hike, go for a bike ride or grab fishing poles and go fishing with your loved ones. Go over to the village and play pool, borrow board games and DVD’s to take back to your luxury home. Try all things local to to Montana! I fell in love with huckleberry everything-Huckleberry pancakes, Huckleberry BBQ ribs, huckleberry cocktails, and more. We loved the Montana beers and wine and I’m now obsessed with Blue Sky Cherry Soda. If you have your own car, go for a ride. You can drive all along the 37,000 acre property. Be prepared to be very sad to leave the Resort at Paws Up. It’s an amazing vacation to a special place like no other. My guess is if your vacation is anything like ours you will be dreaming of returning soon. 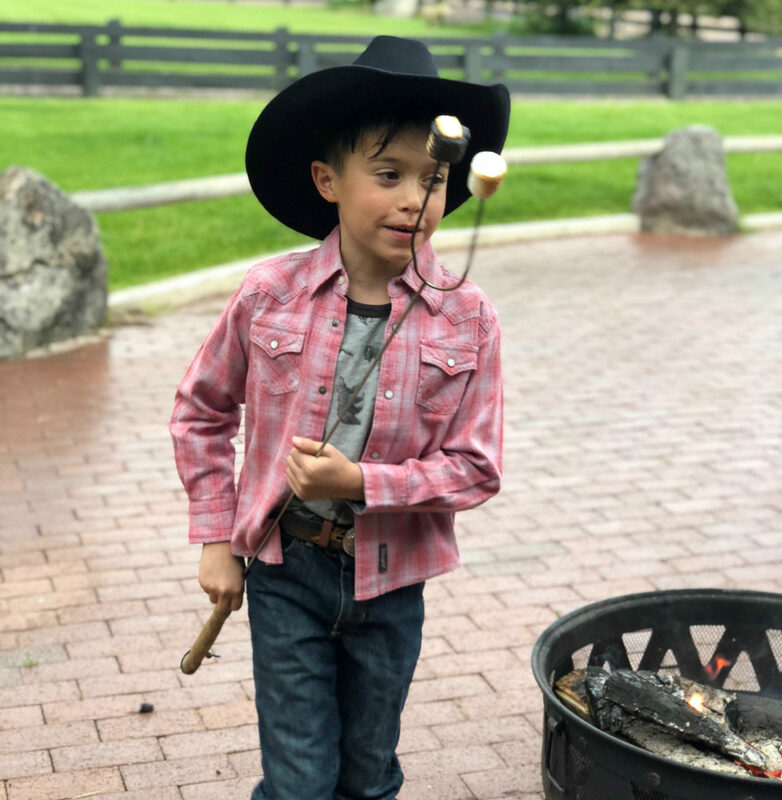 We made so many unforgettable memories while glamping in Montana, we definitely look forward to returning soon for s‘more!